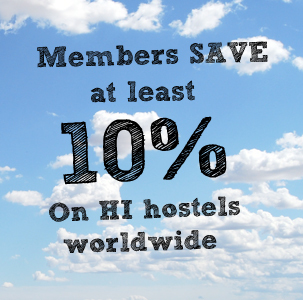 Hostelling International (HI) is the brand name of 72 Youth Hostel Associations forming the International Youth hostel Federation and represents nearly 4,000 hostels in 91 countries. HI is a non-profit membership organisation, with a proud history and a relevant philosophy: our mission is to promote cultural education, peace and international understanding through travel – offering affordable, safe, quality accommodation to people of all ages, races, religions and nationalities. With over 4 million members worldwide HI is one of the largest youth membership organisations in the world. HI currently provides 35 million overnight stays a year, many of which are booked through the hihostels.com website that provides a global booking system for hostels worldwide. As part of the youth travel industry which is both dynamic and varied, our offices provide a range of services to global stakeholders and customers. We have a young team and are currently in exciting times as we launched a new digital platform in 2014 which was the biggest single investment in the history of the organisation and has opened up a new and exciting range of opportunities. There are currently two job vacancies available at Hostelling International. Please see below for further details. What the candidate will need to offer? The role would ideally suit a confident, enthusiastic personality, who is highly organised and has strong communication skills. Willingness and enthusiasm are essential to this position as is the ability to question, investigate and make informed recommendations. As the role is varied and requires working with staff at all levels globally on a daily basis the candidate must be educated, adaptable and with a strong interest in travel, intercultural matters and sustainability. With strong computer literacy (word and excel as a minimum) and the ability to learn new systems the ideal candidate will be numerically strong and literate and be a good team worker. The candidate will need to be fluent in English as it is our working language and knowledge of a second language will be highly valued (particularly German, Chinese or Japanese). This person will support the Sustainability Manager in the implementation of campaigns/projects to support our sustainability strategy in three areas: social, ecological and economical. As well as creating content and sourcing images for the website, creating and analysing surveys, and writing for the press and the organisation’s intranet to ensure we deliver a strong sustainability message to our customers and stakeholders. Communicating in sustainability; news, achievements, campaigns etc. Please send applications, including CV and covering letter, to Cécile Yerle, Communications & Events Manager at cyerle@hihostels.com by Tuesday 7 April at 12.00 GMT. This person will support the Sales & Marketing department which is made up of three areas, Customer Marketing, Groups Marketing and Communications & Events. The role involves the implementation of sales and marketing campaigns to support sales of overnight accommodation and ancillary revenue streams, sourcing potential new partners for hihostels.com and other revenue generating activities. As well as creating content and sourcing images for the website the candidate will be involved in creating and analysing surveys, writing for the press and the organisation’s intranet and assisting with organisation of internal events. Please send applications, including CV and covering letter, to Cécile Yerle, Communications & Events Manager at cyerle@hihostels.com by Tuesday 7 April 12.00 GMT. Je suis française et SUREMENT trop âgée pour satisfaire à vos offres d’emplois. Utilisatrice des services de Hostelling International pour mes déplacements en France, j’adhère TOTAL aux commentaires et appréciations sur vos structures d’accueil. Je tenais à vous en remercier et par ce biais, ayant encore un étudiant à charge, SAVOIR SI vous recrutez des jeunes durant les vacances scolaires pour la gestion ou l’accompagnement dans vos différentes Auberges en France, Allemagne ou Angleterre, langues dans lesquelles à priori mon fils de 24 ans est susceptible de se “débrouiller”.